Freshman general studies major Jaime Baldwin checks out the material at the missions display in the library. This week is mission week at Southwestern Adventist University. Students, faculty and staff spend time celebrating, and praying for, missionaries and mission work all over the world. Pictures of past and present Southwestern missionaries, including staff and faculty, are being shown on the monitors around campus. Also, there is a display around campus inviting people to pray for countries and the missionaries in them. People pick a country to pray for, and then wear a provided nametag with that country’s name on it. All day Wednesday, the cultural celebration continues as people are invited to dress up in an outfit that represents a country. The outfit does not have to represent a country from a person’s specific heritage, but it can be any country. On Thursday, students are invited to worship at Dilts Chapel, which is in the basement of Harmon Hall. The worship will be a special program with a focus on mission work. The program starts at 9:30 a.m.
Friday night vespers at the Keene Seventh-day Adventist Church will also focus on mission work. Vespers starts at 8 p.m., so come a few minutes early. 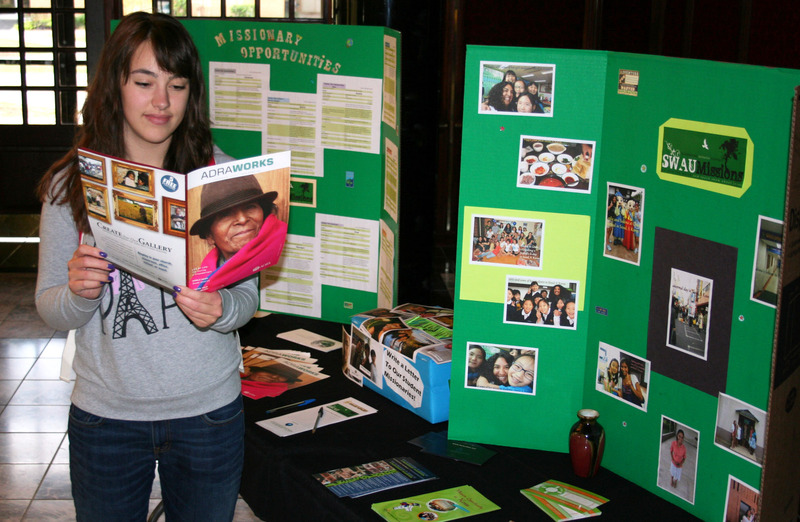 Finally, missions fair invites all people to share their own missionary experience. All people are invited, and the event is taking place on Saturday afternoon from 3 to 5 p.m. It is located at the Chan Shun Centennial Library in the Meadows Gallery.